2019 Cadillac XTS Trim Levels with Comparisons & Configurations. What 2019 Cadillac XTS Trim Level Should you Buy? What is the Difference Between Trims? For many consumers out there, the sedan is the ideal car. A full-size sedan has plenty of room for passengers and cargo but typically gets better gas mileage and is easier to maneuver on busy city streets than an SUV or truck. Seeing how Americans spend much of their time on the road, it only makes sense for consumers to want a vehicle that offers comfort, convenience, and performance. The 2019 Cadillac XTS has a lot to offer prospective buyers. It is one of the most comfortable vehicles out there, especially on long trips. There are plenty of highly desired standard features and an interior with ample space for everyone. Part of the first generation of the XTS that was introduced back in 2013, the 2019 edition does not see many changes. It received a mid-cycle refresh in 2018. One difference that consumers will enjoy is the larger wireless charging pad. This pad is compatible with both Apple and Android products and is more powerful than before. Consumers interested in the 2019 Cadillac XTS will have five different well-equipped trims to choose from. The Standard trim has many cutting edge technology and convenience features, and each step up only adds more. At the top of the line, consumers will find a turbo-twin engine option in addition to many luxurious features. The following guide is intended to highlight the most important differences between the trim levels of the 2019 XTS in order to aid consumers in making an informed decision. 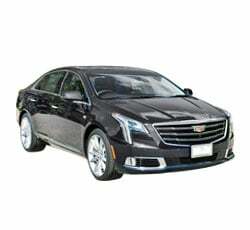 Compare the 2019 Cadillac XTS Standard vs Luxury Trim Levels. What is the difference? The standard engine for the XTS is a 3.6-liter V6 that gives drivers 304-horsepower and 264 lb-ft of torque. It is paired with a 6-speed automatic transmission. The Standard is the only trim available exclusively with front-wheel-drive. On the outside of the XTS, consumers will get LED headlamps and taillamps. It features a capless fueling system and rides on 19" 10-spoke alloy wheels. These wheels have chrome inserts and a pearl nickel finish. Moving inside the cabin of the XTS, buyers will find dual-zone climate control, 8-way power front seats with 4-way lumbar support and leather surfaces, and a steering wheel with leather trim. There is also authentic wood on both the steering wheel and center console. Consumers will enjoy the adaptive remote start, push-button start, and keyless entry. Technology features include the Cadillac User Experience, which allows the driver to control their entertainment and comfort features. Music can be played on the 8-speaker Bose sound system. There is Bluetooth capability and four USB ports for streaming music. All versions of the XTS also come with a 3-month or 3GB data trial for the Cadillac 4G LTE built-in WiFi hotspot that comes standard. There is also a 5.7" Driver Information System. Safety features include Rear Park Assist and the Teen Driver program. The Teen Driver program can associate certain key fobs with certain vehicle settings to encourage teenagers to drive safer. There is also a standard Rear Vision Camera. The Luxury trim is powered by the same engine/transmission combination. It does add many new features to the interior, however. The front seats are both heated and ventilated. Second-row seats are also heated. Consumers will find a heated steering wheel and fancier wood trim touches. There is an LED ambient lighting package and the Memory Package. This package allows for two presets for the position of the steering wheel, driver's seat, and outside mirrors. While the wheels are similar, the ones on the Luxury trim have 7-spokes and a sterling silver finish. The driver and passenger mirrors are powered and the door handles illuminate. This trim adds auxiliary daytime running lamps. There is also a dual-outlet integrated exhaust. This is the first trim level to offer optional all-wheel-drive. When it comes to the tech, this trim adds navigation to the Cadillac User Experience. It also has both Front and Rear Park assist and well as Automatic Parking Assist. It is important to note that Automatic Parking Assist is only available on front-wheel-drive models. Finally, this trim adds rain-sense windshield wipers. Ultimately, the Luxury trim is only worth upgrading to if the consumer is concerned about having all-wheel-drive. Other than that and the navigation, there are not enough differences to justify the jump in price. Compare the 2019 XTS Luxury vs Premium Luxury Trims. What is the difference? Moving up to the Premium Luxury does not change the powertrain or drivetrain options. It does add Magnetic Ride Control, which is designed to improve the handling of the vehicle. The headlights are upgraded to IntelliBeam and this trim sits on 20" 10-spoke alloy wheels featuring a sterling silver finish. The memory package for the Premium Luxury trim includes both the driver and front passenger seats. These seats also gain thigh adjustments in order to make the ride as comfortable as possible. With this trim, consumers will gain tri-zone climate control as well as a 12-volt power outlet. There are some significant tech upgrades made as well. This trim has a 14-speaker Bose Studio Surround sound system. It also comes with a Heads Up Display and 12" reconfigurable gauge cluster. One of the most attractive features of the Premium Luxury trim is the standard inclusion of the Driver Awareness Package. This adds many high-tech safety features, including Rear Cross Traffic Alert, Low-Speed Forward Automatic Braking, Forward Collision Alert, Following Distance Indicator, Safety Seat Alert, and Surround Vision. With Surround Vision, drivers are given a 360-degree bird's eye view of their vehicle, helping them to park and maneuver when traveling at a low-speed. This trim will be attractive to consumers due to all of the additional safety and convenience features. Relatively speaking, it does not cost much more than the Luxury trim, making it a smart buy for many. Compare the XTS Premium Luxury vs Platinum Trim Levels. What is the difference? Near the top of the XTS line sits the Platinum trim. This has many desirable exterior features, such as the UltraView power sunroof. This sunroof covers both the front and rear seats and includes an Express-Open and Express-Close feature, as well as a power sunshade. There is an exclusive Platinum grille as well as Platinum 20" alloy wheels with ultra-bright machined finish. Inside of the Platinum, buyers will find 22-way adjustable seats that have a massage feature. The headliners are microfiber-sueded. This trim has a leather-wrapped instrument panel and Premium floor mats. In the rear, there are sunshades. There is an armrest in the rear that has both sunshade and audio controls built-in. Driver assistance safety features are added by this trim as well. They are part of the Driver Assist Package and include Advanced Adaptive Cruise Control and Forward and Reverse Automatic Braking. Whether or not this trim is worth it to a consumer will depend on what features they consider "must-haves." For many buyers, the additional leather and seating adjustments will not justify the price. While the Driver Assist Package does offer appealing features, it is an available option on the Premium Luxury. Compare the XTS Platinum vs V-Sport Platinum Trims. What is the difference? Essentially, the V-Sport Platinum is the same as the Platinum, with one major exception. Underneath the hood of the V-Sport lives a Twin Turbo 3.6-liter V6 that will give drivers 410-horsepower and 369 lb-ft of torque. This trim also comes with standard all-wheel-drive. Due to the differences in engines, it is important for consumers to realize the V-Sport Platinum trim does not get nearly as high of numbers when it comes to fuel efficiency. The standard engine is EPA estimated at 19 MPG in the city and 28 MPG on the highway. The Twin Turbo V6, however, is only estimated at 16 MPG in the city and 21 MPG on the highway. This will definitely be a consideration for many consumers. Other than that, the differences are few and far between. This trim does add a specialized V-Sport grille and V-Sport Platinum 20" wheels. Inside the cabin, the only change is the addition of a V-Sport theme to the reconfigurable gauge cluster. Due to the few changes between this trim and the one before it, it will ultimately come down to performance desires. Unless the consumer is terribly concerned about how quickly they can accelerate, they will likely be more than satisfied with the standard engine option. Being a Cadillac, there really is no "bad" choice when it comes to the XTS. Even the entry-level trim comes with many upscale features. That being said, there is a wide range of both features and price tags when it comes to the 2019 XTS. For many consumers, the smart buy will be the Premium Luxury, which sits in the middle of the trim scale. It offers enough extra standard features to make it worth the price jump from the Luxury trim. All of the standard safety features are sure to be attractive to buyers as well. Consumers will want to upgrade to all-wheel-drive, particularly if they live somewhere with rough winters. While the V-Sport Platinum is very tempting, it has a significantly higher price tag than the other trims. Some reviews have noted that the standard V6 does feel a bit sluggish getting up to speed at times, but cruises beautifully when it gets there. If this is a major concern, the V-Sport Platinum is the way to go because it is the only one to offer the Twin Turbo V6. For most consumers, the 2019 Cadillac XTS Premium Luxury represents a smart buy due to the advanced safety and convenience features.